In 1896 the government passed the Locomotive Act enabling private people to operate their own petrol-driven automobiles. At the beginning, petroleum spirit was only available from chemists or specialised stores. In time however, Petrol Stations started to open. Below is a list and description of all the Petrol Stations, that ever existed in the village - only one is now remaining. 1896 - Bemister's Stores, 91 West Street A photograph of about 1896 shows a sign on the building of Bemisters Stores reading "Pratt's Spirit". This was the earliest form of petrol available, and would have been stocked for use by the local gentry. It is possible that some local farm machinery was also petrol driven, and it is known that by 1914 Major Radclyffe owned a 35-hp Daimler motor car at Hyde House. 1920s to 1950s - Corner Shop/17 North Street Mr Arthur Janes took over his father's shop and responding to demand from "passing trade" set up a petrol-pump at the front of the shop, on the Poole road side. A photograph of the late 1920s/early 1930s shows Mr Janes outside the shop together with an early pump and "Mobiloil" signs. It is known that T.E. Lawrence (aka T.E. Shaw; aka Lawrence of Arabia) stopped here on his motor-cycle to purchase petrol, and chat with the locals on "the cross" by 1933. Another set of pumps were set up in a pull-in space on North Street shortly after this. You can see them in the Photograph here. 1929 - Central Garage, 33 West Street Opposite the Drax Arms, Mr Charles Kelloway had his engineers and blacksmiths business adjacent to No.33 (now gone) together with workshops behind. By the time of the 1931 Trade Directory, he described his trade as "repairs, cycles, accessories, blacksmith", with the business name "Central Garage". There was a pull-in and two Shell petrol pumps from this time and a 1000 gallon underground tank. There was a big sign on the gable end of No.33 saying "Central Garage", the sign was still there in a photograph of 1957 and the business continued until about 1958-60. Mr Kelloway died in 1962. 1949 - West End Garage On the south side of the road, adjacent to an ex-WW1 65-foot long wooden hut, a petrol station was set up by the Coles family. Petrol pumps were begun on the east side of the hut and the kiosk was also a small shop selling cycle parts and sweets etc. It was called "West End Garage", and the hut survived until demolition after 1988. By the 1960s another site was opened over the road (in the triangle of land now occupied b y The Chaneles) and called "Woodbury Hill Service Station", but this site finally closed in the late 1970s before the Chaneles were built. The site had remained derelict for over two years. In the 1960s a new Shell Filling Station was built to the east of the WW1 building. This consisted of a pull-in site and a small shop, and continued until closing in about 1980. An aerial photo dated February 1970 shows the 65-foot wooden building and adjacent pull- in space, and the next-door newer Filling Station in full operation. A photo of 1984 shows the newer forecourt still visible before the current dwellings (No. 43/44) were put up in the late 1980s. 1956 - Old Barn Service Station Situated in the space between No.36/37 and No.38 West Street on the site of the "Old Barn" dating back to perhaps 1680 originally. 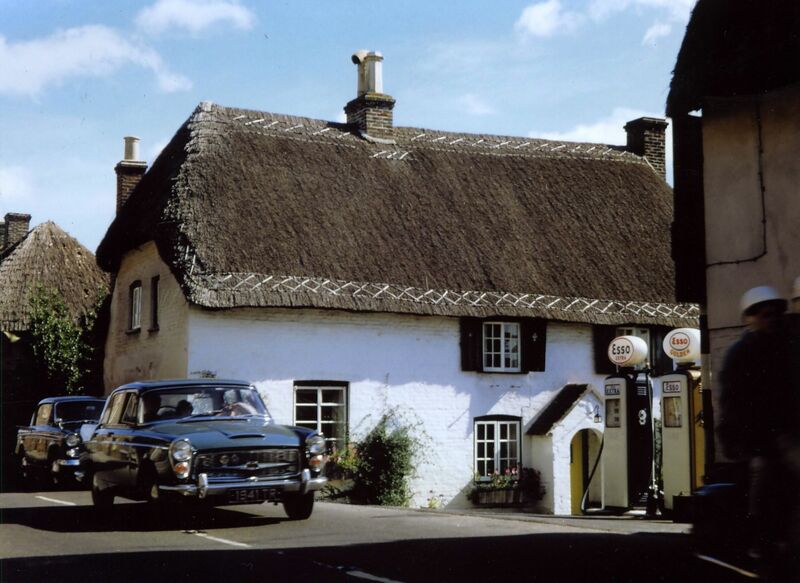 Mr & Mrs Charles Jarvis set up the pull-in filling station in late 1956, selling Esso petrol, while the building also included an "Esso Servicentre" for car servicing and repairs. It was extended to the east by an additional building put up in 1961. There were four pumps and three 750 gallon underground tanks plus a 325 gallon underground diesel tank. It finally closed in the first half of 1988 and was demolished in April 1989. 1992 - Townsend Filling Station Situated on the by-pass at the junction of the A35 and A31, a photograph dated January 1991 shows the site empty, but the industrial units built. Originally this eight-pump filling station was owned by Margram and leased to BP, but by about 1995 was owned by Shell, as it still is in 2011. All the village filling stations had closed by the time the Townsend site went into operation. It is now one of the busiest filling stations in the area due to competitive pricing of petrol and diesel. The site also has an extensively stocked shop and a car-wash unit. In 1896 the government passed the Locomotive Act enabling private people to operate their own petrol-driven automobiles. At the beginning, petroleum spirit was only available from chemists or specialised stores. In time however, Petrol Stations started to open. Below is a list and description of all the Petrol Stations, that ever existed in the village - only one is now remaining. 1896 - Bemister's Stores, 91 West Street A photograph of about 1896 shows a sign on the building of Bemisters Stores reading "Pratt's Spirit". This was the earliest form of petrol available, and would have been stocked for use by the local gentry. It is possible that some local farm machinery was also petrol driven, and it is known that by 1914 Major Radclyffe owned a 35-hp Daimler motor car at Hyde House. 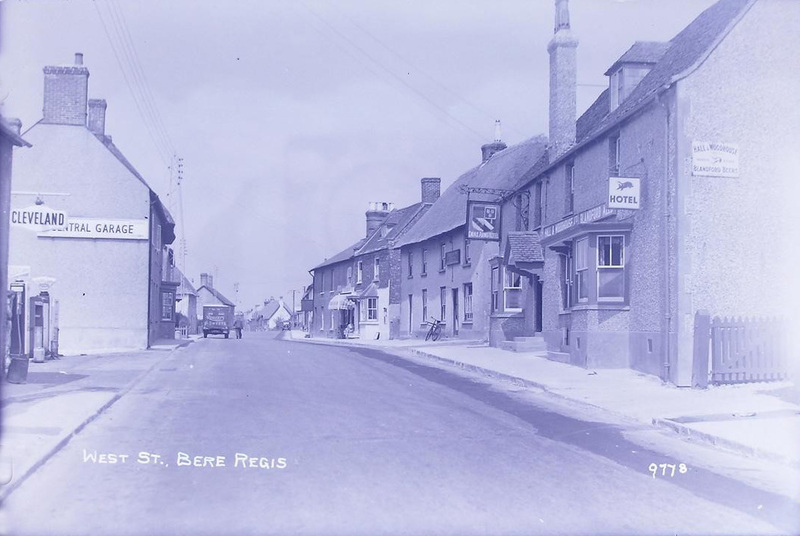 1920s to 1950s - Corner Shop/17 North Street Mr Arthur Janes took over his father's shop and responding to demand from "passing trade" set up a petrol-pump at the front of the shop, on the Poole road side. A photograph of the late 1920s/early 1930s shows Mr Janes outside the shop together with an early pump and "Mobiloil" signs. It is known that T.E. Lawrence (aka T.E. Shaw; aka Lawrence of Arabia) stopped here on his motor-cycle to purchase petrol, and chat with the locals on "the cross" by 1933. Another set of pumps were set up in a pull-in space on North Street shortly after this. You can see them in the Photograph here. 1929 - Central Garage, 33 West Street Opposite the Drax Arms, Mr Charles Kelloway had his engineers and blacksmiths business adjacent to No.33 (now gone) together with workshops behind. By the time of the 1931 Trade Directory, he described his trade as "repairs, cycles, accessories, blacksmith", with the business name "Central Garage". There was a pull-in and two Shell petrol pumps from this time and a 1000 gallon underground tank. There was a big sign on the gable end of No.33 saying "Central Garage", the sign was still there in a photograph of 1957 and the business continued until about 1958-60. Mr Kelloway died in 1962. 1949 - West End Garage On the south side of the road, adjacent to an ex-WW1 65-foot long wooden hut, a petrol station was set up by the Coles family. Petrol pumps were begun on the east side of the hut and the kiosk was also a small shop selling cycle parts and sweets etc. It was called "West End Garage", and the hut survived until demolition after 1988. By the 1960s another site was opened over the road (in the triangle of land now occupied by The Chaneles) and called "Woodbury Hill Service Station", but this site finally closed in the late 1970s before the Chaneles were built. The site had remained derelict for over two years. In the 1960s a new Shell Filling Station was built to the east of the WW1 building. This consisted of a pull-in site and a small shop, and continued until closing in about 1980. An aerial photo dated February 1970 shows the 65-foot wooden building and adjacent pull-in space, and the next-door newer Filling Station in full operation. A photo of 1984 shows the newer forecourt still visible before the current dwellings (No. 43/44) were put up in the late 1980s. 1956 - Old Barn Service Station Situated in the space between No.36/37 and No.38 West Street on the site of the "Old Barn" dating back to perhaps 1680 originally. Mr & Mrs Charles Jarvis set up the pull-in filling station in late 1956, selling Esso petrol, while the building also included an "Esso Servicentre" for car servicing and repairs. It was extended to the east by an additional building put up in 1961. There were four pumps and three 750 gallon underground tanks plus a 325 gallon underground diesel tank. It finally closed in the first half of 1988 and was demolished in April 1989. 1992 - Townsend Filling Station Situated on the by-pass at the junction of the A35 and A31, a photograph dated January 1991 shows the site empty, but the industrial units built. Originally this eight-pump filling station was owned by Margram and leased to BP, but by about 1995 was owned by Shell, as it still is in 2011. All the village filling stations had closed by the time the Townsend site went into operation. It is now one of the busiest filling stations in the area due to competitive pricing of petrol and diesel. The site also has an extensively stocked shop and a car-wash unit.